A customer of ours has a 2015 Mazda MX-5. The car had a fault with the A/C system, which was not blowing cold air. We replaced a seal on the A/C high-pressure pipe where it connects to the A/C compressor, as it appeared to be leaking refrigerant. Now, after only a few months, the vehicle has come back to the workshop with the same fault. Can you help? We have had reports of a fault that affects MX-5 models within the year ranges 14/05/15 to 19/06/18. Check the A/C high- pressure pipe where it connects to the A/C compressor. On closer inspection, you will find a hairline crack in the A/C high-pressure pipe. 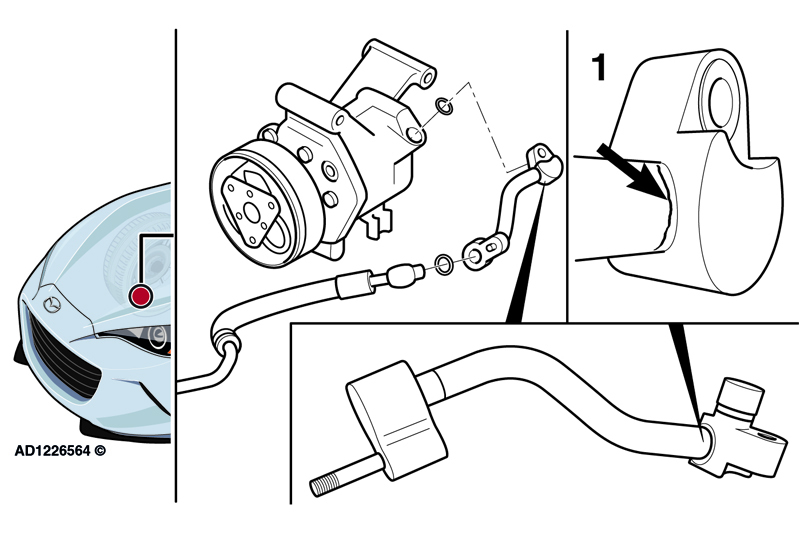 The damage to the A/C high-pressure pipe is caused by engine movement. Fit a modified A/C high-pressure pipe. Recharge the A/C system with the correct quantity of refrigerant. This should rectify the fault.